"Church With A Voice Like A Trumpet"
Now is the time to start gaining a deeper understanding of the Gospel and to experience a deepening fellowship with God. Be part of the church worship services of OLD LANDMARK CHURCH OF GOD HOLINESS IN CHRIST in Chicago, IL. We are a welcoming Christian community that will help you discover God’s plan for your life. Our church was a mission of the late Apostle Robert L. Mitchell. 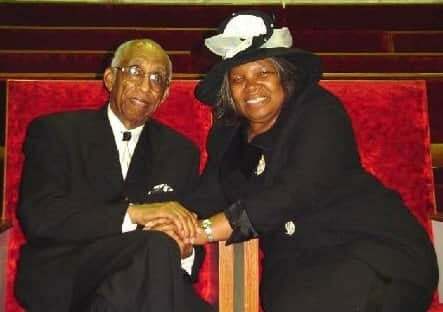 He founded the church in the year 1956 and continued to be the pastor and overseer until God called him home in 2013. Our current pastor is Bishop Lary Schiefelbusch also a member of the Old Landmark Church of God Holiness In Christ under the leader of Apostle Robert L. Mitchell for 43 years. Surrender all your worries to God and fill your life with divine wisdom. We welcome you to our church worship services, Bible studies, and other church events where you can learn more about our faith in God, Christ, and the Holy Ghost. Contact us to speak with our church pastor today. 7201-15 S. Apostle Robert L. Mitchell Blvd.